Elizabeth Brake, a junior accounting major from Lincoln, Nebraska pitches her solution to fitness, nutrition and motivation issues, to the judges. With only three minutes to pitch an entire business plan, student entrepreneurs at the tenth annual 3-2-1 Quick Pitch Competition put it all on the line to win. Hosted by the Center for Entrepreneurship at the College of Business on November 1-2, the competition provided college and high school students the opportunity to present their business ideas for the chance to win cash prizes totaling nearly $10,000. 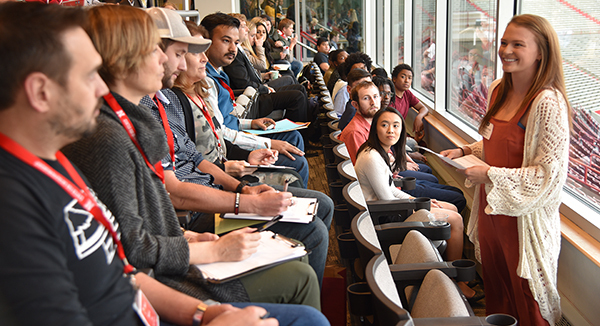 More than 100 students from high schools and colleges across Nebraska came together in the West Memorial Stadium Club Level Suites for the contest. This year the event split into two days with the first for collegiate competitors and the second for high school competitors. Students separated into several rooms across the suites and received three minutes to pitch their idea to a panel of judges comprising local business and community leaders. Dr. Sam Nelson, director of the center and assistant professor of practice in management, noted dividing the competition into two days allowed the center to include more than 120 competitors, a 70 percent increase in one year. Christina Oldfather advises the collegiate competitors to utilize the resources within Lincoln when starting a business. Megan Boyle, a sophomore finance major from Elmhurst, Illinois, pitched her idea for a wearable clip which when in dangerous situations, acts as a tracker and contacts local authorities when clicked three times. Boyle’s idea and presentation skills won over the judges, and led her to be one of three winners in her room. Nebraska Entrepreneurship Advocate Award – Christina Oldfather is the director of innovation and entrepreneurship for the Lincoln Partnership for Economic Development and interim co-managing director of NMotion, a startup accelerator in Lincoln, Nebraska. She dedicates her time to building entrepreneurial communities and helping entrepreneurs succeed with programs like StartupLNK and LaunchLNK. She also helped organize 1 Million Cups, Lincoln Startup Week, the JumpStart Challenge and serves as the chapter director of Startup Grind x Lincoln. Start-Up Executive Award – Dillon Sadofsky, a development team lead at ISoft Data Systems, Inc., assisted with making the company grow from a startup to a stable business. Sadofsky also helped start Presage Analytics, developing the software that helps big and small food safety businesses across the country. He also was a founder of Clockwork Demon, a local computer game company. New Company Entrepreneur Award – Pixel Bakery, an award-winning creative studio, provides services ranging from animation and videography to production and print design. Jordan Lambrecht, Karley Johnson and Tony Bertino founded the studio in 2015. Since its foundation, Pixel Bakery continues to work on a wide range of creative projects, such as a teaser video for KANEKO and the animations for the opening titles to a video series by SoulPancake. Nebraska Distinguished Entrepreneur Award – Spreetail c/o Brett Thome, the vice president of business development, dedicated the award to the whole company of Spreetail, an e-commerce company established in Lincoln. Spreetail sells products focused on home, backyard and outdoors, working with companies like Amazon and eBay. The company has grown since its inception in 2006 to eight cities across six states. Dillon DeRozairo, a senior at Millard North High School, pitches his idea in the final round of the high school division. The high school competition ended in a surprise final round of competition. Selected randomly, a winner from each of the five rooms were asked to pitch their idea one last time, this time in front of a newly formed panel of judges, as well as their peers. Wooing the crowd and judges, Ben Blumenthal, a senior from Millard Academy, came out on top as the overall high school 3-2-1 Quick Pitch champion – earning him a slightly higher prize amount. As one of the judges for the collegiate level of the competition, Pixel Bakery’s Jordan Lambrecht, managing partner and creative director, left impressed by the competitors. Lambrecht looked for enthusiasm and passion in the competitors. The range of students – from chemical engineers to business and advertising majors – surprised him. “Starting a business is a very daunting task, so take it in bite sizes. Learning is a constant, so never stop. It is important to reflect every day and think, ‘What did I learn today, and why am I better because of it?’ Otherwise you can get overwhelmed and drown in how much there is to do,” he said. Sponsors of the event included Cameron General Contractors, Hastings HVAC, Lincoln Chamber of Commerce, Nelnet and Resort Lifestyle Communities. To learn more about the Center for Entrepreneurship, visit: http://business.unl.edu/entrepreneurship.